Bethesda, MD : Woodbine House, 2008. Covers medical care, daily care, family life, development, early intervention, learning, legal rights, and much more, the new edition is a complete roadmap to every aspect of your child&apos;s health and well being from birth through age five. 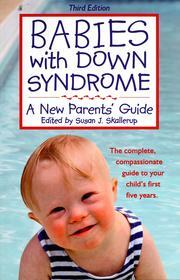 Babies with Down syndrome : a new parents&apos; guide. 100 ME:PersonalName $a Personal name Skallerup, Susan J., ed. $b Remainder of title a new parents&apos; guide. 300 Physical Desc $a Extent 358. 520 Summary $a Summary, etc. note Covers medical care, daily care, family life, development, early intervention, learning, legal rights, and much more, the new edition is a complete roadmap to every aspect of your child&apos;s health and well being from birth through age five. 650 Subj:Topic $a Topical term Children with mental disabilities.